If you're an egg lover, then this masala omelette recipe is for you! It is loaded with punchy flavors and delicious taste. Its a great way to include veggies with indian spices mixed with eggs. This Indian-inspired omlette is the easiest dish to prepare at home in a jiffy & it makes a great choice when your kids are bored with plain egg omelette for breakfast. 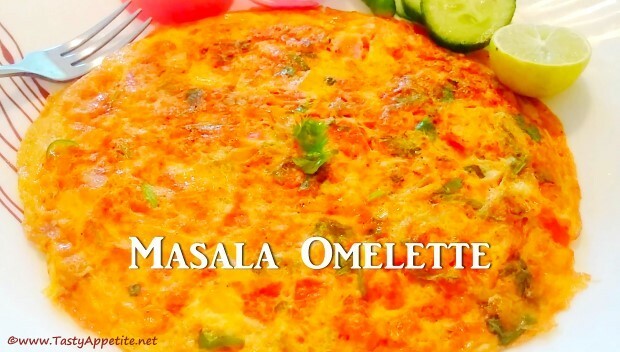 Lets see how to make quick & easy masala omelette recipe with this simple video recipe! In a mixing bowl, add turmeric pwd, red chilli pwd, pepper pwd, cumin pwd, salt, garam masala pwd and 1/4 cup of water or milk. Beat eggs directly into the bowl. Add sliced onions, tomato, capsicum, green chilli, mint and coriander leaves. Add a tsp of oil and combine well. Add 2 to 3 ladles full of spicy egg mixture to the hot pan and spread to dosa shape. Keep flame in low and cook for 2 to 3 minutes. Drizzle oil to sides and flip the omelette to other side carefully. Cook for a minute and turn off flame. Take it in serving plate and garnish with finely chopped coriander leaves. Healthy flavorful delicious masala omelette is ready.